If you’re here, you’re probably a business owner or CEO. You’ve already taken a big step forward in your career—you’re a self-starter with a massive amount of dedication and passion. You even have a few big successes to show for all of your extremely hard work. Challenges and spotlights don’t scare you, and you’ll jump at an opportunity if you see it. The problem might be that you don’t feel like you’re seeing opportunities anymore or which moves are the right ones to take. You’re looking to take the next step toward increasing your revenues and profits, but you’re already on top of your own game. You know you’ve come a long way, but it seems like you’ve hit a plateau. Things just aren’t growing the way that you’d hoped, and you’re not sure what your next moves should be. 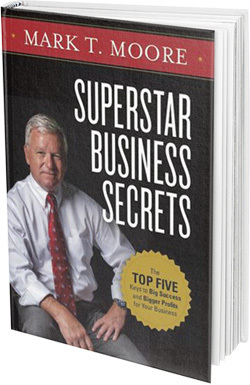 Mark T. Moore, author of Superstar Business Secrets: The Top Five Keys to Big Success and Bigger Profits for Your Business, founder of Sales KnowHow, and an accomplished business leader with over 30 years of success, is here to help you. Mark is one of the top global business advisors and loves working with goal-oriented, success-driven people, like you, to help you on your way to becoming a successful Superstar Business. Effective business coaching is the difference between just making it by every quarter and becoming a standout in your industry. Mark is a business advisor and CEO coach who will make sure that you’re doing everything in your power to see the success you’ve worked so hard for by sharing and teaching the same principles that he’s learned, used, and developed along his own pathway to success. Mark has seen a lot of success and achievement in his decades of experience. He began with a sales career that evolved into so much more. He was eventually recruited to grow global sales and distribution channels for a number of software companies in both the United States and in Australia and did business on many continents. He built and sold many of his own Superstar Businesses in both countries as well and oversaw a number of major international sales and distribution channels. On top of it all, he mentors and assists the owners of medium sized businesses all over the United States and Australia, lending his consulting and speaking talents to businesses and private groups. With so many years and such a variety of experiences, there are a lot of things that you can learn from a leader among business advisors. Mark knows what makes a Superstar Business Owner from every possible angle and can help you make your business successful and profitable. All you need to do is get in touch by filling out the online contact form.